JurassicCollectables Highlights the Rebor "Raptors"
In response to popular demand, those highly talented people at JurassicCollectables have produced a video highlighting the range of “Raptors” that have been made by Rebor. In this highly informative video, the narrator takes the viewer on a tour of the numerous dromaeosaurid models produced by Rebor. This is a chronological tour, not in terms of the geological age of the fossils, but a timeline that lists the order in which these replicas were produced. As JurassicCollectables are big fans of the movie franchise “Jurassic Park/Jurassic World”, the figures, most of which are very reminiscent of the Velociraptors seen in the films, the narrator is able to discuss some of his favourite pieces. In this video review, which lasts a little over thirteen minutes, the first replica to be discussed is “Windhunter”, the Utahraptor figure (Utahraptor ostrommaysorum), which ironically is geologically much older than the Velociraptors depicted in the video. The Rebor replicas have proved to be so popular, as not only are they excellent sculpts, but they remind collectors of the Velociraptors from the film franchise. Some of the Rebor models pay tribute to Stanley “Stan” Winston, the American television and film special make-up effects creator responsible for the majority of the dinosaurs seen in the early “Jurassic Park” films. This explains some of the names chosen by Rebor such as the baby Velociraptor figure “Stan” and the 1:18 scale cursorial replica “Winston”, which the narrator heralds as one of his personal favourites. Rebor 1:18 scale Velociraptor model. It is not only the people behind the films that are honoured by this part of the Rebor range. When the first film in the dinosaur-themed franchise came out, “Jurassic Park”, in 1993, a series of limited-edition bronze dinosaur models were cast. 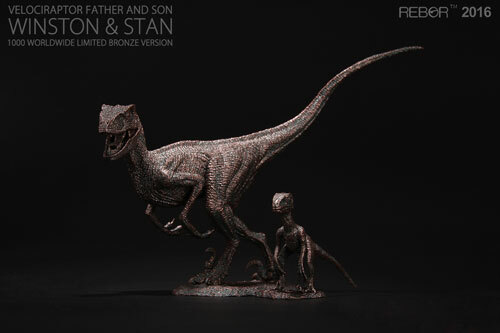 Rebor produced their own limited-edition “Raptors” the bronze-effect “Father and Son” figures which were based on the “Winston and Stan” Velociraptor replicas. In the video, the commentator points out the superb detailing on these figures and even highlights the areas on the models where the bronze-effect has been given a greenish tinge, to mimic the metal as it ages. The Rebor replicas “Winston and Stan”. Only 1,000 of these model sets were produced, still, Rebor fans can view these figures in the JurassicCollectables video. JurassicCollectables have done a good job in discussing the various Rebor models representing “Raptors” in chronological order, from the first to be produced to the latest such as “Gunn” and “Rose”, for completeness here is Everything Dinosaur’s list of Rebor dromaeosaurids from the first model to be produced to the very latest to come off the production line. Rebor has plans to add more dromaeosaurids to their model range. Collectors will have the chance to add even more figures to their very own raptor pack. As for personal favourites, we agree with the narrator in the JurassicCollectables video, “Winston” is very popular amongst Everything Dinosaur team members, but for the moment, this replica is just pipped by a nose by the excellent Velociraptor “Pete”. A cursorial (running Velociraptor) called “Pete from Rebor.